The Worlds Top 5 Central Banks in an unprecedented move joined forces at 2pm GMT to make $100 billions available to the retail banking market. The important point is that unlike previous liquidity boosts, the monies will be made available at favourable market rates which are much lower than the interbank rate. 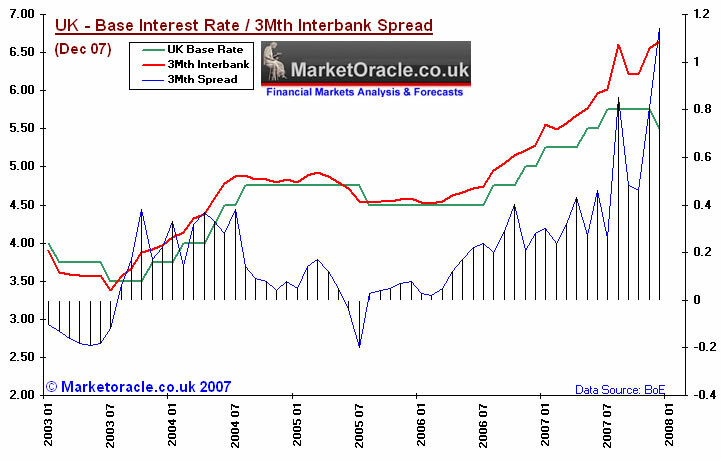 In London the Interbank money markets had remained frozen even after following an interest rate cut by the Bank of England to 5.50% from 5.75%. This immediately sent panic signals to the Bank of England and across the worlds central bankers as the interbank rate remained at 6.64%, thus widening the spread to the base rate to highs not seen since the 1980's. The danger was that monetary policy was failing to have any impact on the banking system. It is highly likely that the worlds central banks agreed to the current statement prior to the US Fed's decision to cut the Fed Funds rate yesterday to 5.25%, which similarly resulted in very little change in the interbank spread. So how did the interbank money markets react to the announcement ? There was very little reaction in the interbank market with the rate remaining stubbornly above 6.60% for 3 month Libor. However, the actual central bank auctions have yet to take place therefore no actual monies related to the announcement have so far been loaned to the retail banks. The auctions are scheduled to occur over the next 2 weeks. Also it will take time before the retail banks are able to replenish reserves from bad debt provisions before they are in a position to loan monies to other banks on the interbank market. Will the Financing be Successful ? Unlike the Bank of England's previous emergency financing at a penal rate of 100 basis points above base rates. Which failed to attract any bidders. This announcement is expected to be successful, due to the global nature of the financing and the much more favourable terms. However it will require further financing on similar terms during the New Year of more several hundreds of billions of dollars to unfreeze the credit markets. The announcement does send a clear signal to the credit markets that the worlds Central Banks are prepared to provide the type of financing that the money markets have been crying out for since the credit crunch started to bite barely 4 months ago. The announcement further confirms my forecast that the US will avoid a recession during 2008, though growth will still be sharply lower than 2007, forecast in the region of 1.5% to 3%.